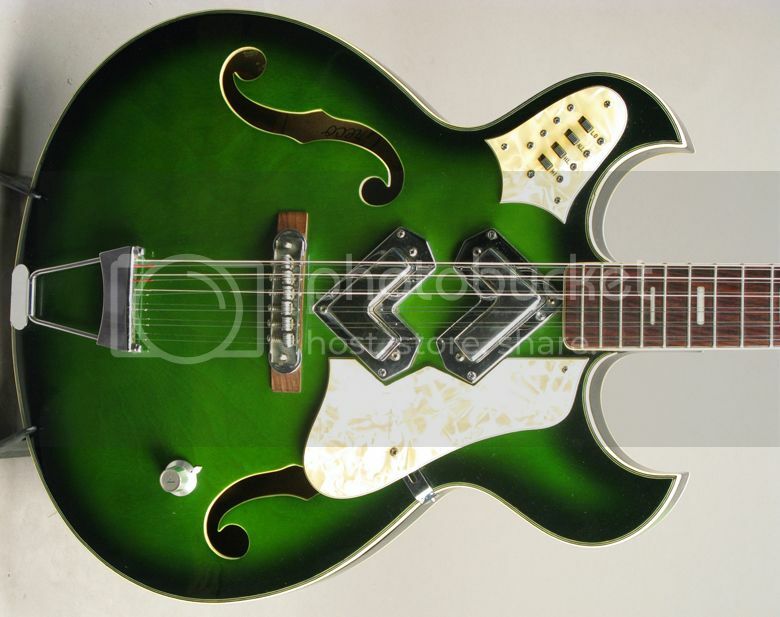 We've previously looked at these Greco semi-hollowbodies with crazy V-shaped pickups before on Guitarz (see here and here) but the example pictured above is all the more rarer for being a 12-string. This guitar differs from the 6-string Greco Shrike in that it doesn't have the same contoured - almost German carve - top, plus the pickup selector switch panel is located on the upper horn rather than on the lower bout. Note too the body and neck binding and proper f-holes rather than the Shrike's diamond-shaped soundholes. 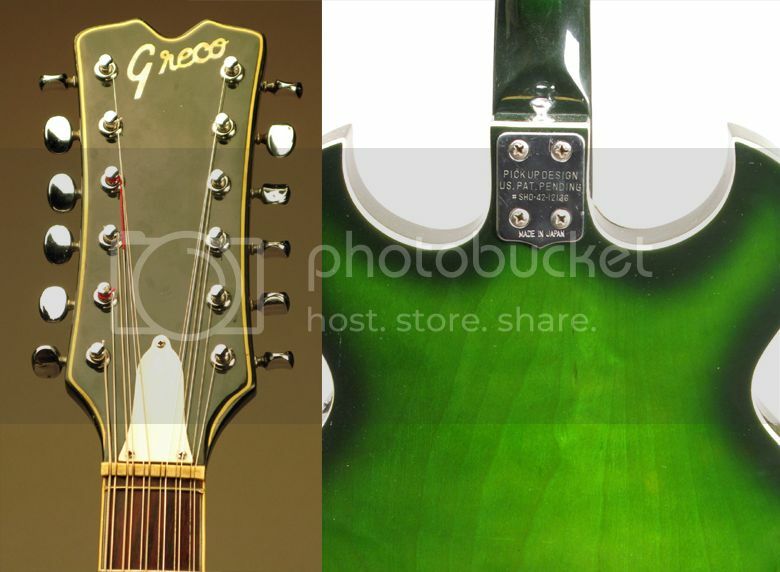 I'm not sure if technically it is a "Shrike" - the eBay seller lists it as being a Greco Model GR-960. The neck plate of the guitar mentions that the pickup design is U.S. patent pending, SH0-42-12136. I do like the single volume control. I often think that's all you need. Currently being offered for sale on eBay with a Buy It Now price of $1,595. Correction, L-shaped pickups. Apparently, the coils pick up 2 and 4 strings per pickup. It's not at all clear to me how pickups and switching work here. If the pickups are indeed split 4+2 strings, and since they're mounted oppositely, that would mean that the neck-lows-bridge-highs combination would miss the middle two strings. Maybe there's enough overlap so that's not a problem in practice, I dunno. And I would think that would be a mighty sudden timbral transition across the middle strings as you go from the neckiest edge of the neck pickup to the bridgiest edge of the bridge pickup. Also, the switches appear to be regular slide switches, as opposed to radio buttons where you can only choose one at a time. So I'm curious what the switches do and how they work in combinations. One possibility: perhaps the pickups are 3+3 strings and not 4+2 strings, and they are mechanically arranged inside the case to look like an "L". (Ie., the shorter side is three strings, and the longer side is three strings, but placed atop the shorter side). Compare these pickups to the Boomerang pickups on the Gibson Flying V2, and how thick those are at the center.